You have selected the FRT Digital Course, Jump Starts and Member Community [Lifetime Access] membership level. The price for membership is $1,277.00 now. By purchasing this program or product you (herein referred to as "Client") agree to the follow terms stated herein. If you do not understand or agree with any of the following conditions, please do not purchase Freelance Road Trip Business Road Map, Navigator Intensive, Tune-Ups or Jump Starts. If you require further clarification, please contact Freelance Road Trip. Alvalyn Lundgren (herein referred to as "Owner", "Us", "We", or "I") agrees to provide Program, Freelance Road Trip Business Road Map (herein referred to as Program), identified in online commerce shopping cart. Client agrees to abide by all policies and procedures as outlined in this agreement as a condition of their participation in the Program. 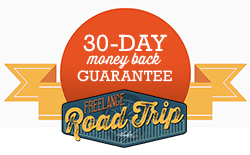 The fee for Freelance Road Trip Business Road Map include the following option: 1 payment of $1,275.00 (due today). Client authorizes the Owner to charge Client’s credit card or debit card for the FULL amount. Client understands Alvalyn Lundgren (herein referred to as Owner) is not an employee, agent, lawyer, doctor, manager, therapist, public relations or business manager, registered dietician, or financial analyst, psychotherapist or accountant. Client understands that Owner has not promised, shall not be obligated to and will not; (1) procure or attempt to procure employment or business or sales for Client; (2) Perform any business management functions including but not limited to, accounting, tax or investment consulting, or advice with regard thereto; (3) act as a therapist providing psychoanalysis, psychological counseling or behavioral therapy; (4) act as a public relations manager (5) act as a publicist to procure any publicity, interviews, write-ups, features, television, print or digital media exposure for Client; (6) introduce Client to Owner’s full network of contacts, media partners or business partners. Client understands that a relationship does not exist between the parties after the conclusion of this program. If the Parties continue their relationship, a separate agreement will be entered into. None of the Owner's trainings claim that you will succeed in your freelance business, or that you will acquire clients or work. The Owner makes no claim or guarantee of earnings. What the Owner guarantee is that you will be satisfied with the training, and that, if you complete the steps laid out, you will be able to launch your creative freelance business. What you do after you complete the training and launch your business, or whether or not you launch your creative freelance business is completely up to you. There is no guarantee that you will earn any money using the techniques and strategies in the trainings and materials offered. Earning potential is entirely dependent on the person using my training, ideas and techniques. I (the Owner) does not position this product as a get rich or easy money scheme. Examples in these materials are not to be interpreted as a promise or guarantee of earnings. Many factors will be important in determining your actual results and no guarantees are made that you will achieve results similar to mine or to anybody else’s. In fact no guarantees are made that you will achieve any results from our ideas and techniques in our material. Your level of success in attaining the results claimed in our training depends on the time you devote to the training and the concepts and exercises included. Since these factors differ individual to individual, we cannot guarantee your success or income level. Nor are we responsible for any of your actions or decisions. Materials and trainings on this website may contain information that includes or is based upon forward-looking statements within the meaning of the Securities Litigation Reform Act of 1995. Forward-looking statements represent our expectations or forecasts of future events. You can identify these statements by the fact that they do not relate strictly to historical or current facts. They use words such as “anticipate,” “estimate,” “expect,” “project,” “intend,” “plan,” “believe,” and other words and terms of similar meaning in connection with a description of potential earnings or financial performance. Any and all forward looking statements here or on any of our sales material are intended to express an opinion of earnings potential. Many factors will be important in determining your actual results and no guarantees are made that you will achieve results similar to mine or anybody else’s, in fact no guarantees are made that you will achieve any results from our ideas and techniques in our material. These trainings are based in the United States, and any reference to legal filings, business structures and banking are based on policies, procedures and laws in the United States. In the event that you decide your purchase was not the right decision, within 30 days of enrollment, contact Freelance Road Trip to request a refund by the 30th day at 11:59, PST. I will ask you to submit your course work and provide evidence that it did not work for you. I want you to be satisfied with your purchase but also want you to give your best effort to apply all of the strategies in the course. I offer a 30-day refund period for purchases. However, in order to qualify for a refund you must submit proof that you did the work in the course and it did not work for you. In the event that you decide your purchase was not the right decision, within 30 days of enrollment, contact us by the 30th day at 11:59 PST at connect@freelanceroadtrip.com and let us know you’d like a refund. You must include your coursework with your request for a refund. If you request a refund and do not include your coursework by the 30th day, you will not be granted a refund. Requirement 5: Tell us why this course was not a good fit for you and your business needs. What did you expect that you did not get once you began the Road Map program? Please note: Where payment plans are applicable, if you opted for a payment plan and you do not request a refund within 30 days and submit the required coursework at the time of your refund request, you are required by law to complete the remaining payments of your payment plan. All refunds are discretionary as determined by us. To further clarify, we will not provide refunds after the 30th day from your date of purchase and all payments must be made on a timely basis. If payments are not made on time, you agree to pay interest on all past-due sums at a rate of 2.0% per month or the highest rate allowed by law, whichever is greater. In the event that your refund request is approved, the amount refunded will be prorated for the digital downloads (worksheets, spreadsheets and tools), which are licensed to you for your use as part of your registration fee, the access you received to the exclusive video training content during those 30 days, and for any Pit Stop and/or Tune-Up session you participated in. Processing fees are nonrefundable. In the event that physical materials are included with the course selected, you must return all materials in their original condition by the 30th day in order to qualify for a refund. Processing and shipping charges are nonrefundable. We will not provide refunds more than 30 days following the date of enrollment. After day 30, all payments are non-refundable and you are responsible for full payment of the fees for the program regardless if you complete the program. Upon refunding your registration fee, or if you cancel your membership without refund after 30 days, you will no longer have access to the Freelance Road Trip members forum on Facebook. We do not provide and refunds for purchases of digital downloads. The Owner respects Client’s privacy and insists that Client respects the Owner’s and Program Participants (herein referred to as “Participants”). Thus, consider this a mutual non-disclosure agreement. Any Confidential Information shared by Program participants or any representative of the Consultant is confidential, Proprietary, and belongs solely and exclusively to the Participant who discloses it. Parties agree not to disclose, reveal or make use of any Confidential Information or any transactions, during discussions, on the forum or otherwise. Client agrees not to use such confidential information in any manner other than in discussion with other Participants during Program. Confidential Information includes, but is not limited to, information disclosed in connection with this Agreement, and shall not include information rightfully obtained from a third party. Both Parties will keep Confidential Information in strictest confidence and shall use the best efforts to safeguard the Confidential Information and to protect it against disclosure, misuse, espionage, loss and theft. Client agrees not to violate the Consultant’s publicity or privacy rights. Furthermore Client will NOT reveal any information to a third party obtained in connection with this Agreement or Consultant’s direct or indirect dealings with Client including but not limited to; names, email addresses, third-party company titles or positions, phone numbers or addresses. Additionally, Consultant will not, at any time, either directly or indirectly, disclose confidential information to any third party. Further, by purchasing this product you agree that if you violate or display any likelihood of violating this session the Consultant and/or the other Program participant(s) will be entitled to injunctive relief to prohibit any such violations to protect against the harm of such violations. Freelance Road Trip Business programs are copyrighted and original materials that have been provided to Client are for Client’s individual use only under a single-user license. Client is not authorized to use any of Owner’s intellectual property for Client’s business purposes. All intellectual property, including Owner’s copyrighted program and/or course materials, shall remain the sole property of the Owner. No license to sell or distribute Owner’s materials is granted or implied. By purchasing this product, Client agrees (1) not to infringe any copyright, patent, trademark, trade secret, or other intellectual property rights, (2) that any Confidential Information shared by the Owner is confidential and proprietary, and belongs solely and exclusively to the Owner, (3) Client agrees not to disclose such information to any other person or use it in any manner other than in discussion with the Owner. Further, by purchasing this product, Client agrees that if Client violates, or displays any likelihood of violating, any of Client’s agreements contained in this paragraph, the Owner will be entitled to injunctive relief to prohibit any such violations and to protect against the harm of such violations. Program is developed for strictly educational purposes ONLY. Client accepts and agrees that Client is 100% responsible for their progress and results from the Program. Owner makes no representations, warranties or guarantees verbally or in writing. Client understands that because of the nature of the program and extent, the results experienced by each client may significantly vary. Client acknowledges that as with any business endeavor, there is an inherent risk of loss of capital and there is no guarantee that Client will reach their goals as a result of participation in the Program. Program education and information is intended for a general audience and does not purport to be, nor should it be construed as, specific advice tailored to any individual. Consultant assumes no responsibility for errors or omissions that may appear in any program materials. In the event that any cause beyond the reasonable control of either Party, including without limitation acts of God, war, curtailment or interruption of transportation facilities, threats or acts of terrorism, State Department travel advisory, labor strike or civil disturbance, make it inadvisable, illegal, or impossible, either because of unreasonable increased costs or risk of injury, for either Consultant to perform her obligations under this Agreement, the Owner’s performance shall be extended without liability for the period of delay or inability to perform due to such occurrence. Client agrees they used Owner’s services at their own risk and that Program is only an educational service being provided. Client releases Owner, her officers, employees, directors, subsidiaries, principals, agents, heirs, executors, administrators, successors, assigns, instructors, guides, staff, Participants, and related entities any way as well as the venue where the Programs are being held (if applicable) and any of its owners, executives, agents, or staff (hereinafter “Releasees”) from any and all damages that may result from any claims arising from any agreements, all actions, causes of action, contracts, claims, suits, costs, demands and damages of whatever nature or kind in law or in equity arising from my participation in the Programs. Client accepts any and all risks, foreseeable or unforeseeable. Client agrees that Owner will not be held liable for any damages of any kind resulting or arising from including but not limited to; direct, indirect, incidental, special, negligent, consequential, or exemplary damages happening from the use or misuse of Owner’s services or enrolment in the Program. Owner assumes no responsibility for errors or omissions that may appear in any of the program materials. The Parties agree and accept that the only venue for resolving such a dispute shall be in the venue set forth herein below. The parties agree that they neither will engage in any conduct or communications with a third party, public or private, designed to disparage the other. Neither Client nor any of Client’s associates, employees or affiliates will directly or indirectly, in any capacity or manner, make, express, transmit speak, write, verbalize or otherwise communicate in any way (or cause, further, assist, solicit, encourage, support or participate in any of the foregoing), any remark, comment, message, information, declaration, communication or other statement of any kind, whether verbal, in writing, electronically transferred or otherwise, that might reasonably be construed to be derogatory or critical of, or negative toward, the Owner or any of her programs, members, owner directors, officers, Affiliates, subsidiaries, employees, agents or representatives. Client may not assign this Agreement without express written consent of Owner. Owner may modify terms of this agreement at any time. All modifications shall be posted on the Freelance Road Trip website and purchasers shall be notified. Owner is committed to providing all clients in the Program with a positive Program experience. By purchasing this product, Client agrees that the Owner may, at her sole discretion, terminate this Agreement, and limit, suspend, or terminate Client’s participation in the Program without refund or forgiveness of monthly payments if Client becomes disruptive to Owner or Participants, Client fails to follow the Program guidelines, is difficult to work with, impairs the participation of the other participants in the Program or upon violation of the terms as determined by Owner. Client will still be liable to pay the total contract amount. Client shall defend, indemnify, and hold harmless Owner, Owner’s officers, employers, employees, contractors, directors, related entities, trustees, affiliates, and successors from and against any and all liabilities and expense whatsoever – including without limitation, claims, damages, judgments, awards, settlements, investigations, costs, attorneys fees, and disbursements – which any of them may incur or become obligated to pay arising out of or resulting from the offering for sale, the sale, and/or use of the product(s), excluding, however, any such expenses and liabilities which may result from a breach of this Agreement or sole negligence or wilful misconduct by Consultant, or any of its shareholders, trustees, affiliates or successors. Client shall defend Owner in any legal actions, regulatory actions, or the like arising from or related to this Agreement. Client recognizes and agrees that all of the Owner’s shareholders, trustees, affiliates and successors shall not be held personally responsible or liable for any actions or representations of the Owner. In consideration of and as part of my payment for the right to participate in Freelance Road Trip Programs, the undersigned, my heirs, executors, administrators, successors and assigns do hereby release, waive, acquit, discharge, indemnify, defend, hold harmless and forever discharge Owner, Freelance Road Trip and its subsidiaries, principals, directors, employees, agents, heirs, executors, administrators, successors, and assigns and any of the training instructors, guides, staff or students taking part in the training in any way as well as the venue where the Programs are being held (if applicable) and any of its owners, executives, agents, or staff (hereinafter “Releasees”) of and from all actions, causes of action, contracts, claims, suits, costs, demands and damages of whatever nature or kind in law or in equity arising from my participation in the Programs. If not resolved first by good-faith negotiation between the parties, every controversy or dispute relating to this Agreement will be submitted to the American Arbitration Association. All claims against Owner must be lodged within 100 days of the date of the first claim or otherwise be forfeited forever. The arbitration shall occur within ninety (90) days from the date of the initial arbitration demand. The parties shall cooperate to ensure that the arbitration process is completed within the ninety (90) day period. The parties shall cooperate in exchanging and expediting discovery as part of the arbitration process. The written decision of the arbitrators (which will provide for the payment of costs) will be absolutely binding and conclusive and not subject to judicial review, and may be entered and enforced in any court of proper jurisdiction, either as a judgment of law or a decree in equity, as circumstances may indicate. In disputes involving unpaid balances on behalf of Client, Client is responsible for any and all arbitration and attorney fees. Any notices to be given hereunder by either Party to the other may be effected by personal delivery or by mail, registered or certified, postage prepaid with return receipt requested. Notices delivered personally shall be deemed communicated as of the date of actual receipt; mailed notices shall be deemed communicated as of three (3) days after the date of mailing. For purposes of this Agreement, “personal delivery” includes notice transmitted by fax or email. Email: help[at]thetribecourse[dot]com. This Agreement shall be binding upon and inure to the benefit of the parties hereto, their respective heirs, executors, administrators, successors and permitted assigns. Any breach or the failure to enforce any provision hereof shall not constitute a waiver of that or any other provision in any other circumstance.This Agreement constitutes and contains the entire agreement between the parties with respect to its subject matter, supersedes all previous discussions, negotiations, proposals, agreements and understandings between them relating to such subject matter. This Agreement shall be governed by and construed in accordance with the laws of the State of California, United States of America. Unless otherwise noted, all products come with a 30-day guarantee. Longer conditional guarantees may apply, so check the sales material at the time of your order for details. If you do not understand or agree with any of these conditions, please do not purchase this program or material. If you require further clarification, please contact connect@freelanceroadtrip.com. If you have any questions or problems, please let us know by contacting us at connect@freelanceroadtrip.com. Do not use phone or other means to make your refund request or to report a problem.